Cue the Mail, the Telegraph and rights-for-all-except-those-we-don't-like politicians peddling the 'human rights are the root of all evil' meme again. Let's get something straight from the start - both the Mail's and the Telegraph's headlines are misleading. The Mail screams Europe's war on British justice: UK loses three out of four human rights cases, damning report reveals. The Telegraph's is a more staid, apparently factual statement ECHR: Britain loses 3 in 4 cases at human rights court. Just look at that pie chart again. Only 3% of the cases that the UK faces in the European Court of Human Rights ever get to a judgment. 97% are rejected as inadmissable or struck out. 97%. Of the 3% that go through the full process in the Court, the UK has lost 271 and won 86 of a total number of 357 cases since 1959. 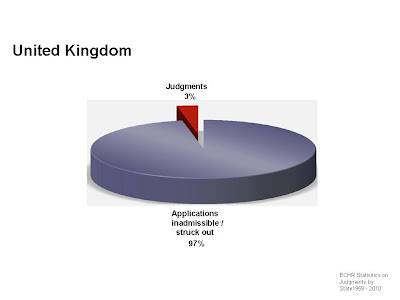 So the UK loses about three quarters of 3% of cases or about 2.3% of the cases that it faces in the ECHR. It's worth repeating that - the UK loses only a little over 2% of its cases at the ECHR. To use a favorite UK sporting metaphor, that's one helluva batting average. So the Mail's notion that the ECHR is making a mockery of British justice is somewhat difficult to defend. In fairness to the Telegraph, although the heading is misleading, the body of the article is largely devoted to reporting on the report that makes the claims. Unfortunately it's the heading that will stick in the mind. It is ironic, though, that mainstream media and politicians, in a country that fought two world wars in the 20th century and has been and continues to be engaged in multiple other military adventures in the name of freedom, take such an antagonistic perspective on human rights. I'm not necessarily defending the ECHR as an absolute bastion of virtue. At the opposite end of the scale the Court has been criticised for taking such a convoluted approach to human rights law that its decisions have little wider application. It might be a perenniel target for rabble rousing media and politicians but it was not the Court that was at fault when it ruled against the UK in relation to the shooting of unarmed terrorist suspects or the hacking of a police chief's phone because she was suspected of having "frolicked in her underwear". If the benchmark is that someone loses their basic rights as soon as they can be labelled a terrorist or as falling the wrong side of some nebulous sexual (or other) morality line, then then that is sad, dangerous and pretty scary. Even a small campaign group working to stop an energy company dumping waste into local lakes have been labelled "domestic extremists" (aka terrorists). So it's always worth remembering when the rights-for-us-not-for-them brigade are on the march, that ordinary people get unexpectedly caught on the wrong side of that we-don't-like-you-so-you-don't-have-any-rights line. Update: Human Rights blog on same. Adam Wagner's interpretation of the figures is slightly different as he also considers the cases where there were eventual "friendly settlements/striking out judgments" and "other judgments", of which there were 65 and 21 repectively (or 357+65+21=443 in all). The more detailed figures are available in the Court's Violation by Article and by Country 1959-2010 table.